The increasing numbers and expanding influence of supermarket dietitians will have a greater influence on consumers both now and in the years to come. The presence of RDs in supermarkets isn't entirely new, but the phenomenal growth and expanding influence they have on shoppers' health is. According to a survey conducted by the Food Marketing Institute (FMI), on average 85% of supermarkets now have a corporate dietitian on staff, and 30% have RDs in stores. Hy-Vee, a supermarket chain with more than 230 stores in Illinois, Iowa, Kansas, Minnesota, Missouri, Nebraska, South Dakota, and Wisconsin, has RDs in 94% of its stores, with a stated goal of 100%. While hospital dietitians can influence the health and well-being of thousands of people every day, retail dietitians have the potential to influence millions. "Supermarket dietitians are changing the face of public health and retail in America," says Sara Baer-Sinnott, president of Oldways, a Boston-based nonprofit food and nutrition education organization. That change is being implemented in a variety of ways through guided supermarket tours, answering questions in the store aisles, teaching nutrition classes, providing one-on-one counseling, cooking demonstrations, food sampling, creating signage indicating healthier choices on store shelves, and collaborating with other health professionals, including doctors and store pharmacists, as well as chefs. • providing shopping lists and menus for specific health concerns, such as diabetes or hypertension. • Approach men who look lost, and offer assistance. • Appeal directly to what men like—strength and stamina. • Mention the food attributes men care most about—protein, vitamins, and minerals. Avoid the attributes they don't care about, such as low-fat, low-calorie, and phytochemicals, such as flavanols and flavonoids. Supermarket dietitians and the retailers they work for struggle with the challenge of demonstrating a return on their investment for providing wellness services. Most retailers with RDs measure their effectiveness through social media impressions, coupon redemptions, inventory measures, sales tracking, and customer feedback. But dietitians are more concerned with the impact on consumers' health. "There's really no standard for how RDs work for supermarkets," Ruhs says, "so it's hard to assess their impact on health. But all RDs are hired because the supermarket retailer sees how it can build store loyalty, while also impacting consumers' health. Shoppers come to the store to access these nutrition services." Though it varies from chain to chain and even from store to store, many of the services are free or cost a nominal fee. One thing is clear: Retailers that employ dietitians are engaging with customers on health and wellness issues that are important to them. Here's what some of the largest chains in the country are doing. Life and is pronounced "freckle"—see www.phrql.com), a preassessment tool that allows supermarket RDs to track improvements in health markers such as HDL, LDL, and blood pressure in shoppers who attend classes and workshops. Also offered by Hy-Vee is the Begin program, a healthful lifestyle and weight management initiative that offers individual counseling sessions and group classes. McMillin says 70% of those who complete the program lose weight. Wellness challenges for weight loss and increased physical activity also are conducted and offer personal online tracking, where individuals can log their progress and nutrition status, and set goals. McMillin also noted that students are now shadowing Hy-Vee stores' RD to learn how they work within the retail environment, and the company is partnering with universities in its trade areas to present nutrition education programs. Aspiring RDs are coming out of internship programs with the goal of becoming Hy-Vee dietitians. Wakefern Food Corporation operates 270 ShopRite and PriceRite stores in the northeast and currently employs more than 100 dietitians in its ShopRite stores as well as a team of dietitians at Wakefern to support them. The company hired its first retail dietitian in 2006 and plans to increase its RD presence at both the corporate and retail levels. According to Natalie Menza, MS, RD, manager of health and wellness at Wakefern Food Corporation, the company's retail dietitians engage in a variety of community wellness initiatives by partnering with local schools, parent-teacher associations, hospitals, senior centers, public libraries, local businesses, town and city wellness campaigns, and local support groups for weight loss and celiac disease. These initiatives include cooking demos, food sampling, and nutrition education classes, all with the goal of improving health within the community. This Texas-based chain with 300 stores throughout Texas and Mexico began hiring full-time supermarket dietitians in April 2014. "Before that we contracted with RDs on a part-time basis," says Stacy Bates, MS, RD, LD, CDE, registered dietitian programs manager for H-E-B. "But now we have seven RDs full time in addition to myself, and we plan on hiring more." Bates also says that H-E-B's dietitians are focused on the medical community, helping physicians meet the needs of their patients. The company accepts Blue Cross Blue Shield and Humana health insurance plans. They offer corporate wellness programs to local businesses at a nominal fee, some as low as $10 as a one-time payment. "We conducted a 10-week weight-loss challenge with the city of San Antonio, and participants lost more than 700 lbs total." H-E-B offers free general supermarket tours and charges a small fee for disease-specific tours for those with diabetes, celiac disease, or hypertension. They also offer several cooking classes for kids, such as the HalloWeekend cooking classes held the weekend before Halloween. Offering such supermarket nutrition programs often requires RDs to have a well-rounded education in dietetics and community health. In fact, the better educated and informed supermarket dietitians are, the more likely they will be to have an impact on shoppers' health. Nutrition conferences specifically targeting supermarket dietitians were nonexistent just a few years ago, but there are several opportunities now, including presentations at the annual Academy of Nutrition and Dietetics Food & Nutrition Conference & Expo®, which focus on the where, when, and how for supermarket RDs. The implicit goal for dietitians at these meetings is to improve public health in the communities they serve. Following are some of the top meetings for retail dietitians. This annual event, which is by invitation only, connects about 60 retail dietitians with food companies committed to improving public health. Dietitians from as far away as England, Israel, Brazil, and Sri Lanka have reached out to learn more about promoting public health through supermarkets in their own countries. "We're very passionate about empowering the RD to explore ways to become a valuable resource for the community," says Georgia Orcutt, program manager for Oldways. For more information about the symposium, visit http://oldwayspt.org/programs/supermarket-dietitian-symposium/supermarket-dietitian-symposium. For the last three years, along with the Produce Marketing Association's Fresh Summit, the Produce for Better Health (PBH) Foundation has offered a three-day educational and networking program that focuses on shoppers' attitudes and behaviors concerning fruits and vegetables and ways for supermarket dietitians to encourage them to eat more produce. The PBH Foundation also pays all the expenses for 25 to 30 supermarket dietitians to attend its annual conference, The Consumer Connection, which provides sessions on consumer research, information on how health and nutrition activism fits into retail sales, and offers field and grocery store tours. Each year, in association with the National Grocers Association meeting, the PBH Foundation also brings together about 10 supermarket dietitians to attend educational sessions on marketing, finance, compliance, and technology to get them on the same page as retailers. All of these meetings are by invitation only from the PBH Foundation. To find out more information, RDs can contact kstevens@pbhfoundation.org. This invitation-only meeting is in its fifth year. Twenty supermarket RDs from leading chains around the country gather to discuss educational areas of interest and network. Visit www.shoppingforhealth.org for more information. The annual FMI conference is where food retailers from across the country and abroad gather to learn, exchange ideas, and network. Retail dietitians meet and speak with retailers about the services they can offer, including in-store tours, cooking demonstrations, and counseling that can improve the health of the community. Visit www.fmiconnect.net for more information. The RDBA was established to foster the continuing business education and career development of retail dietitians. It has partnered with FMI to develop a retail dietitians' toolkit, which is offered free online. Dietitians just need to create an account (www.retaildietitians.com; www.retaildietitians.com/toolkit). The expanding influence of retail dietitians on shoppers' health and the health of surrounding communities is evidenced not only in the increasing number of RDs in stores but also by the growing number of speakers, symposiums, conferences, and organizations focusing on and targeting retail dietitians—discussing what they do and how they tackle health challenges in the retail setting. 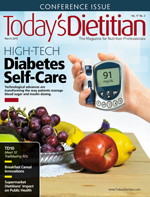 Supermarket dietitians are giving consumers unrivaled access to accurate nutrition information. Instead of having to make an appointment and worry whether it will be covered by health insurance, consumers can walk into a grocery store and talk to a staff dietitian to get the food and nutrition information they need. This gives dietitians the consumers' ear in a location where it may matter the most: the place where they make their food purchasing decisions. What shoppers put in their carts ultimately can impact their health and well-being, and supermarket dietitians are there to help them make the best decisions, based on their health needs, current nutrition knowledge, and budgets. "We're having such great success in the community that we've had to add second and even third dietitians in some stores," McMillin says. "We want to bring the profession of dietetics front and center and offer all of the services that dietitians offer outside of the retail setting." "In order to make a significant difference in health," according to Baer-Sinnott, "it's critical that all parties—health professionals, retailers, food suppliers, and academia—come to the table to share knowledge and create actionable solutions to help these dietitians maximize their impact." "The focus is on prevention," Ruhs says. "If you increase access by having more RDs in supermarkets, the potential to improve public health is huge." Everyone Today's Dietitian interviewed agreed that dietitians who become well versed in both nutrition education and the retail business side of supermarkets will only benefit from the blending of the two worlds and ultimately have the greatest impact on public health.